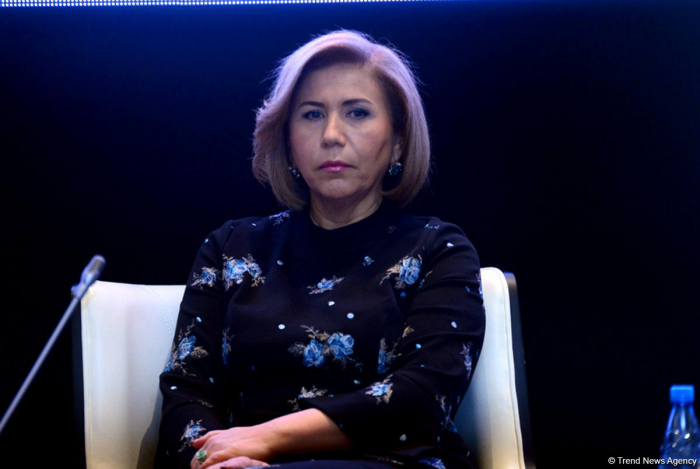 By hosting such forums as the Baku Forum on Sustainable Development, Azerbaijan proves that it can make a great contribution not only in terms of its national interests but also the interests of the whole world, Vice Speaker of the Azerbaijani Parliament Bahar Muradova said. She made the remarks Oct. 26 as part of the session “Interactive Discussion on the Role of Youth, Women, Parliament, Civil Society and Other Stakeholders on the Way of the Implementation of Sustainable Development Goals” during the Baku Forum on Sustainable Development. She said Azerbaijan has carried out enough work to achieve the Sustainable Development Goals (SDGs). Muradova noted that the social orientation of Azerbaijan’s state budget accelerates the process of achieving these goals. “I believe the Parliament of Azerbaijan decently performs its work in this direction,” the vice speaker said. Muradova noted that 20 percent of Azerbaijan’s territory is under occupation, more than a million people have become refugees and IDPs, but the Azerbaijani state is carrying out serious work to improve the situation of refugees and IDPs, and the Parliament also adopted important laws in this direction. She said the condition of refugees and IDPs in Azerbaijan is better than of those in other countries. Held under the slogan “Shaping a New World and a New Humanity: Creativity and Human Development”, the 6th Baku International Humanitarian Forum that kicked off Oct. 25 brings together 581 delegates from 86 countries and 24 international organizations.